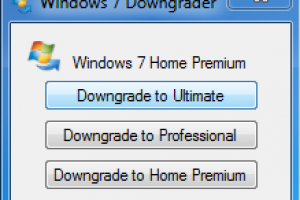 Reverse Windows 7 Enterprise to a previous version"
If you have the Exterprise version of Win 7 and you don’t like it, you can downgrade it (reverse the update) to an earlier version such as Ultimate, Professional or Home Premium. Probably you have just heard of an upgrade of an operating system, The fact that at times some f the operating systems come with different versions, you may need an application that can downgrade the features of this application. In this case, you are looking for a lower bundle to avoid compatibility issues. This is the gap that this application takes care of. It is specifically for the Windows 7 operating system. It is a lightweight application that needs a small hard disk space that means that its presence in the system has no effect when it comes to performance f this application. the installation and download process is simple and straightforward. 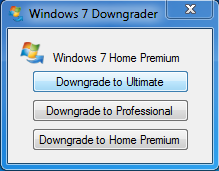 Windows 7 Downgrade is licensed as freeware for PC or laptop with Windows 32 bit and 64 bit operating system. It is in enhancements category and is available to all software users as a free download.